A cryptocurrency exchange called GOPAX (CEO Lee Joon-heng) and Art Center NABI (CEO No So-young) are going to hold South Korea’s first blockchain festival ‘2018 Crypto on the Beach’. This event will be held in Gangwon-do starting from the 17th until the 19th of August and its sponsors will be Korea Foundation for the Advancement of Science and Creativity, Bluepoint, Bomapp, and Mossland. Experts from government organizations, non-profit organizations, and blockchain industry will be studying social roles of blockchain technology. This event will provide opportunities to experience blockchain technology through seminars, education, and Hackathon. Starting with a seminar on ‘Blockchain and Token Economy’ on the 11th of this month, GOPAX and Art Center NABI are also going to 2 other seminars on the 19th and the 25th of this month before hosting 2018 Crypto on the Beach. 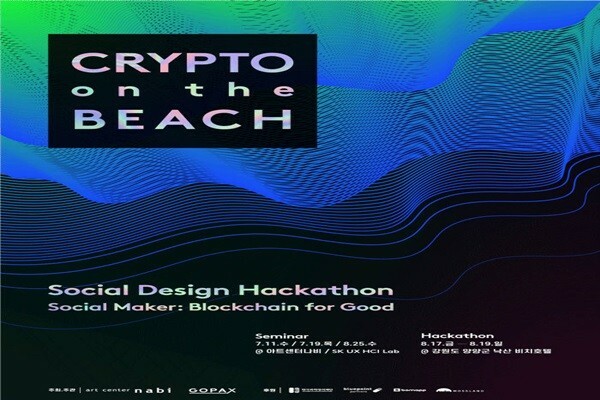 Ideas that are brought up during these seminars will be implemented as prototypes through Hackathon and results and award ceremonies for these ideas will be held on the final day of 2018 Crypto on the Beach. CEO Lee Joon-heng of GOPAX, CEO No So-young of Art Center Nabi, and CTO Gong Yoon-jin of GOPAX will participate as judges.